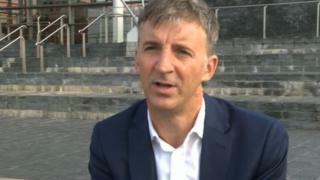 The Wales Bill is being "rammed through Parliament" with only small changes being conceded, the Wales Governance Centre's director has said. The bill, which will give the Senedd new powers, has been revised amid worries it may reduce assembly powers. But Prof Richard Wyn Jones said it had "serious problems" and he was sure AMs "would consider blocking the bill". On Friday, the Wales Office said discussions with the Welsh Government would continue. The Wales Bill has already been debated in the House of Commons and is now being considered by the House of Lords as part of the process of the law entering the statute book. The committee stage of the proposed law's passage through the House of Lords is due to start on Monday. Speaking to BBC Radio Wales' Sunday Supplement programme, Prof Jones said the bill was not fit for purpose as it did not "fulfil the original intentions of settling devolution". "It is genuinely hard to find people who aren't directly involved on the UK government side with a good word to say about this legislation, certainly in terms of the detail," he said. "What was striking, we did have a consensus, an all-party consensus, in terms of moving to a reserved powers model. "What's particularly depressing is, in the enactments of that good intention, we've reached a stage where everybody who is looking at this in a relatively dispassionate way is pointing to some fundamental problems. "I don't think that anybody is going into this wanting it to fail, in terms of the critics. This is the only piece of legislation on the table, there is a sense the status quo is unsatisfactory and so people want this to work. "There have been lots of constructive suggestions for change from the Welsh Government, from the National Assembly presiding office, and yet the legislation is being rammed through Parliament with, so far, only very small changes being conceded." Prof Jones said the Wales Office had been "very consultative," but it was "a very small cog in the Whitehall machine" and did not have the "institutional heft to force other more powerful departments into a more sensible position". He added he hoped to see "serious movement" by the UK government on the reservations list. First Minster Carwyn Jones has expressed "considerable concern" a number of issues have not been resolved, including addressing those around a Welsh legal jurisdiction and the number and breadth of reservations. The Lords Constitution Committee also suggested the bill could create a "recipe for confusion" and could lead to more Welsh bills ending up in the courts. On Friday, a Wales Office spokesman said: "The Wales Bill provides a historic opportunity for the Welsh Assembly to secure more powers and create a stronger, clearer, fairer devolution settlement for Wales. "Discussions will continue with the Welsh Government as the bill goes through Parliament and there will be plenty of opportunity to debate further amendments over the coming weeks." The Wales Bill: What is it and how will it change?